Recently, Carlo Paggiarino published his second arms and armour book through Hans Prunner - this time, focusing on the Wallace Collection. My wife was very kind to me this b-day, and ordered both the Wallace Collection and the Churburg books. These books are probably approaching these collections more from an art/sculpture perspective than from a more study-oriented view (as the Boccia books do, for example). That said, they're pretty awesome, with plenty to study in every photograph. Each volume is beautifully executed - Carlo has a fantastic, artful eye, and the photos are well chosen. The layout and binding of the books is equally nice - with some intro stuff (in English) first, then page after page of photos (nothing else but an unobtrusive page number), and at the end, thumbnail pics with page numbers and a small text blurb about the photo, and catalog numbers. The books are not cheap, nor are they large-run. The Churburg is limited to 2000 copies, and lists at 90 Euros. The Wallace is limited to 1000 copies, and lists at 125 Euros. They ship from Italy, directly from the publisher. In my case, the order was placed last Thursday evening via the publisher's website, and they arrived yesterday morning via Fed-Ex. I consider them to be excellent additions to my library, and I will be very interested in any of Carlo's future publications. Also, Nathan - I was not able to figure a way to add these two books to my reading list here - they have European publication numbers rather than ISBN numbers... not sure if there's any way. Currently not, because they're not on Amazon (where our book database comes from) but I will be manually adding them and some other titles as soon as I find the time to scan / add / etc. I have the Churburg book, and have ordered the Wallace one. I can so far only speak for the former, but it was worth every penny. The detail you can see in the photography is astounding. Its the next best thing to being able to see these pieces up close. Yes. I've had the Churburg for a while and just received the Wallace last week. These are amazing books. While Mr. Paggiarino does look at these pieces as artworks, his photography is done from angles and ranges that reveal details that will astound many an arms and armour afficianado. I can't speak highly enough of these books. Interestingly, my father, who has no interests in arms, spent about an hour with the Churburg book, simply because of the beauty of the photography. A bibliophile of many years, he was amazed simply by what a beautiful book the Churburg volume is. I'll be showing him the Wallace book when my folks are up for the holidays. If you can afford them, you should have both volumes! Thanks for the head's up Aaron, apparently I'm a bit behind the curve here since I'd never heard of either book, but I'm certainly looking into them now! Can I safely assume that the weaponry is also catalogued or is it just the armor? 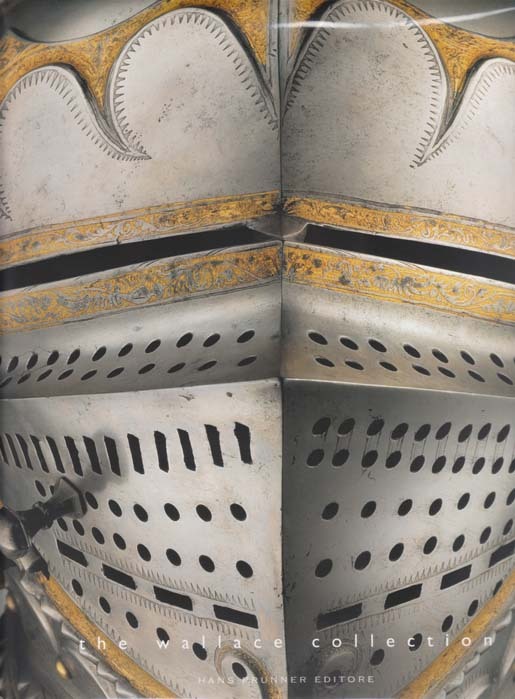 There are shots of some of the weapons in the Wallace Collection book, though armour seems to take center stage. The Churburg book is almost all armour as the collection there is mostly armour. Thanks for the head's up Chad, it looks like my dreams of the Wallace Collection in a full color book with multiple shots of each piece will remain unrealized although these still look like fantastic books! Yeah, these are not a catalogue like you're thinking of. But the shots are exquisite. This helps round out my Wallace themed selection of books. I own this new one, plus the James Mann catalogues (still need the supplement volume though), plus the three volumes of the S.J. Camp catalogues from the 20s and early 40s. I used to own the Laking catalogue (from around the turn of the century) but sold it off. Just to add, both books are sturdily bound in cloth covered boards. The dust jackets are folded over at the top and bottom, effectively doubling the thickness and adding sturdiness to the dust jacket. They should last for years. The cover of the new Wallace Collection book. Copyright Hans Prunner Editore. Note: the distorted line near the top is a reflection off the clear dust jacket protector I put on it. Thank you ever so much for all the compliments. Just back from a lunchbreak at the Wallace collection and was able to have a close look at the book. Well saying that it is absolutely gorgeous is accurate and my credit card was burning my hand so to speak. I can't imagine a better pictural source for anyone insterested in studying or making swords or armour (I also own the original catalogues but this cannot be compared as the wealth of details on each shot is amazing). The £100 drove me off...but I'll be back! Can we order these to ship here in the states? Yes Chris, you can order it right from the Hans Prunner website. The Wallace Collection online store also sells it. Thanks guys, do you know if they take US dollars? I don't purchase items from overseas too often. Generally speaking, your credit card takes care of that type of thing. You don't have to worry too much about that. The Hans Prunner website takes PayPal, which handles the conversion for you.